(Newser) – For six years, a small team of Norwegians has worked tirelessly to recover a famous shipwreck in the remote hamlet of Cambridge Bay in Nunavut, a northern territory of Canada—and as of Saturday, they were finally able to lift it off the ocean floor thanks in large part to giant sausage-shaped balloons. 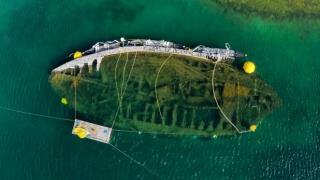 "This is a milestone," Jan Wanggaard, project manager for the Norway-based organization Maud Returns Home, tells the CBC. "To actually see her releasing from the seabed—it's a great experience." He says he was in the water inflating one of the balloons when it first lifted off the seabed and the water became dusty. "I thought, 'Ah, that's a bit strange,'" he says. "I came to the surface and I saw my friend with a big smile." The ship was sold to the Hudson Bay Company. How can he take it to Norway? The Hudson Bay Company may have some say in what he can do with it.